Necesitamos lana, floca, fieltro, hilo de bordar y de coser, agujas de doble punta, agujas rectas, agujas circulares y un marcador. La lana que yo he utilizado es Bravo Big de SMC y la he tejido con agujas del número 10. 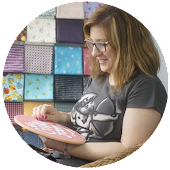 We need yarn, polyester stuffing, felt, embroidery thread and sewing thread, double point needles, single point needles, circular needles and a marker. I have used Bravo Big of SMC and needles, size 10 (U.S.15). Montar 40 puntos y repartirlos en cuatro agujas de doble punta. Colocar un marcador al final de la vuelta que moveremos cada vez que lleguemos a él. Tejemos en redondo y siempre del derecho. Vuelta 2: incr, 18 p, incr, incr,18 p, incr (44 p). Vuelta 4: incr, 20 p, incr, incr, 20 p, incr (48 p). Vuelta 6: incr, 22 p, incr, incr, 22 p, incr (52 p). Vuelta 8: incr, 24 p, incr, incr, 24 p, incr (56 p). Vuelta 10: incr, 26 p, incr, incr, 26 p, incr (60 p). Vueltas 11 a 20: 60 p.
Vuelta 21: dism (ddt), 26 p, dism (T2pj), dism (ddt), 26 p, dism (T2pj) (56 p). Vuelta 23: dism (ddt), 24 p, dism (T2pj), dism (ddt), 24 p, dism (T2pj) (52 p). Vuelta 25: dism (ddt), 24 p, dism (T2pj), dism (ddt), 24 p, dism (T2pj) (48 p). Vuelta 27: dism (ddt), 20 p, dism (T2pj), dism (ddt), 20 p, dism (T2pj) (44 p). Vuelta 29: dism (ddt), 18 p, dism (T2pj), dism (ddt), 18 p, dism (T2pj) (40 p). Vuelta 31: incr, 18 p, incr, incr,18 p, incr (44 p). Vuelta 32: incr, 20 p, incr, incr, 20 p, incr (48 p). Vuelta 35: incr, 22 p, incr, incr, 22 p, incr (52 p). Rellenar con floca. y cerrar (52 p). Vuelta 1: 8 p revés. Vuelta 2: incr, 6 p derecho, incr (10 p). Vuelta 3: 10 p revés. Vuelta 4: incr, 8 p derecho, incr (12 p). Vuelta 5: 12 p revés. Vuelta 6: incr, 10 p derecho, incr (14 p). Vuelta 7: 14 p revés. Vuelta 8: 14 p derecho. Vuelta 9: 14 p revés. Vuelta 10: dism (T2pj), 10 p derecho, dism (T2pj) (12 p). Vuelta 11: 12 p revés. Vuelta 12: dism (T2pj), 8 p derecho, dism (T2pj) (10 p). Vuelta 13: 10 p revés. Vuelta 14: dism (T2pj), 6 p derecho, dism (T2pj) (8 p). 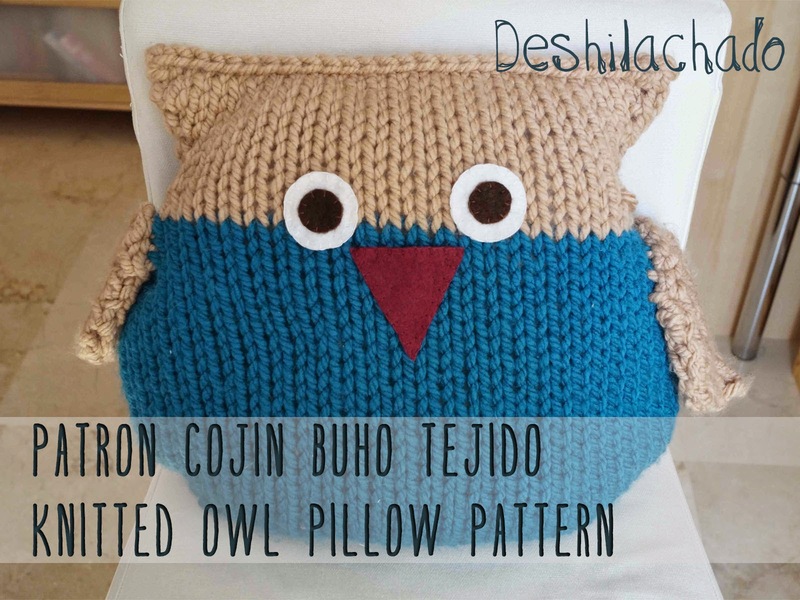 Doblar el ala y coser todo el borde. Después, cosemos las alas al cuerpo. incr: tejemos por el derecho el punto normalmente pero no lo pasamos a la aguja derecha, sino que lo volvemos a tejer por detrás y entonces lo pasamos a la aguja derecha. dism (T2pj): tejemos dos puntos juntos por el derecho. dism (ddt): desplazamos dos puntos de la aguja izquierda a la derecha como si fuéramos a tejerlos por el derecho, los volvemos a pasar a la aguja izquierda y los tejemos juntos por el derecho y por atrás. Corta dos círculos de fieltro blanco, dos círculos más pequeños de fieltro marrón y un triángulo de fieltro granate, bórdalos a punto de festón y cóselos al búho. Cast on 40 stitches, distributed into four double point needles. Place marker and remove it at the end of each row. Knit in the round and all right side rows. Row 2: inc, K18, inc, inc,K18, inc (44 st). Row 4: inc, K20, inc, inc, K20, inc (48 st). Row 6: inc, K22, inc, inc, K22, inc (52 st). Row 8: inc, K24, inc, inc, K24, inc (56 st). Row 10: inc, K26, inc, inc, K26, inc (60 st). Rows 11 to 20: K60. Row 21: ssk, K26, k2tog, ssk, K26, k2tog (56 st). Row 23: ssk, K24, k2tog, ssk, K24, k2tog (52 st). Row 25: ssk, K24, k2tog, ssk, K24, k2tog (48 st). Row 27: ssk, K20, k2tog, ssk, K20, k2tog (44 st). Row 29: ssk, K18, k2tog, ssk, K18, k2tog (40 st). Row 31: inc, K18, inc, inc,K18, inc (44 st). Row 32: inc, K20, inc, inc, K20, inc (48 st). Row 35: inc, K22, inc, inc, 2K2, inc (52 st). Fill with polyester stuffing and cast off (K52). Knit with single point needles. Row 2: inc, K6, inc (10 st). Row 4: inc, K8, inc (12 st). Row 6: inc, K10, inc (14 st). Row 10: k2tog, K10, k2tog (12 st). Row 12: k2tog, K8, k2tog (10 st). Row 14: k2tog, K6, k2tog (8 st). Fold wings in half and sew side seams closed. Next sew each wing to the sides of the body. inc: increase: knit stitch but don't pull the stitch over the rightt needle yet. Bring the top of the right needle around to the back and knit into the back loop of the stitch. ssk: slip two stitches al if to knit, pass the stitches to the left needle, knit both stitches together through the back loop. 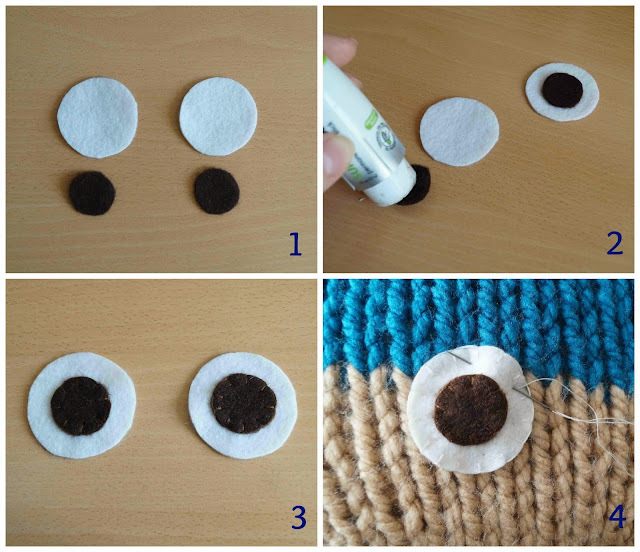 Cut two white felt circles, two smaller brown circles and a maroon felt triangle, embroider the edges in blanket stitch and sew them on the owl.